Close to I 65 and Purdue University. Buses and Trucks welcome, 100% Smoke Free, 24 Hour Reception, Pet Friendly, ADA Compliant, Free Coffee. Red Roof Inn Lafayette is a non-smoking hotel that offers a continental breakfast. All guest rooms include free Wi-Fi and high definition flat screen TVs. We are close to Purdue University and I-65, the Subaru Plant, Home Hospital, Tippecanoe Mall and downtown Lafayette. Near easy access to Indianapolis, Lebanon and Kokomo, Indiana. Red Roof Inn Lafayette is just five miles from Purdue University—home of the Boilermakers. Come and enjoy all this great campus has to offer. The Subaru Plant and Home Hospital are both less than 10 minutes away from this hotel. Just three miles from Tippecanoe Mall, Red Roof Lafayette is 100% non-smoking and located among a row of great restaurants. When you check in, check out the fantastic new amenities in our newly-renovated rooms! The rooms at this non-smoking inn feature new, comfy Rest Suite beds by Serta, new high-end bedding, new flooring and a large, high definition flat screen TV and free Wi-Fi, free unlimited local calls, voicemail, hairdryer and a clock radio in all guestrooms. Select rooms also offer microwave and mini-refrigerator, in-room coffee, iron and ironing board. Free continental breakfast featuring fruit, cereal, muffins, bagels, hot waffles with maple syrup and juice. Free coffee and tea is also available in the lobby. One well-behaved family pet per room is welcome. Spring Fest is an annual event showcasing the lighter side of higher education. This free event is a great opportunity for students of all ages to learn about animals, art, astronomy, and much more in two full days of hands-on activities. It's part education, part entertainment and all fun. Celebrate Gala Week and Mothers Weekend along with the Bug Bowl, Horticulture Show, Veterinary Open House and more. A real garden show featuring plants, gardening supplies, garden decor, lectures and gardening information. This event will be held rain or shine and is a great way to get your green thumb on! Master Gardeners are once again planning their plant sale and will be on hand to offer advice and help with gardening questions. Free and open to the public. Easter means that tomorrow can be different than today, that what is dead can come back to life, and that what seems hopeless is ready for a resurrection. Join us this Easter to experience and celebrate the fresh hope we have in Jesus. Join us for a special celebration full of sweet treats, coffee, and a glow-in-the-dark Easter Egg Hunt for your kids! Activities : Description: The Celery Bog Nature Area is a tranquil spot for wildlife and people alike. You'll find some unusual plants and the opportunity to view nearly 120 different species of birds. Rabbits, coyotes, opossums and other small mammals dwell there, as well as many amphibious creatures-all attracted to its rich and unique wetland habitat. Airport : Thank you for choosing Indianapolis International Airport (IND), where you will find more schedule-friendly nonstop flights to your favorite destinations at competitive prices. Consider it a bonus that you'll fly out of an outstanding new facility with ample parking and valet services like a car wash and oil change. Our spacious, streamlined security checks have lanes for expert and casual flyers, including families and those with special needs. Attractions : The Columbian Park Zoo is located at Columbian Park . The Columbian Park Zoo is the second oldest zoo in Indiana dating back to 1908. The original animals housed at the zoo included foxes, skunks, pelicans, deer, lynx, prairie dogs and a wolf. Today, the Zoo features several “immersion” exhibits and the animal collection consists of nearly 200 animals representing approximately 90 species. The zoo offers a variety of education programs throughout the year that inspire an appreciation for the world's wildlife. Enjoy a butterfly garden, petting zoo, gift shop, Public Art, a "Wild Tykes Play Zone" and more. Admission is free. Dining : Home to 50 draft beers! Full menu includes; appetizers, sandwiches, salads and pizzas. Must be 21+ to enter. Golf : The Ackerman-Allen Course, a Pete Dye design, is an 18-hole, parkland-style, championship golf course. Recently renovated in 2016, the charm of the former Ackerman Hills has been kept with this majestic redesign by Pete Dye, with the addition of all bent grass greens, fairways, and tees. Mature hardwoods line this rolling hills layout, which added acreage to the old back-9 holes, expanding the footprint of the course. With the addition of Ackerman-Allen Course, the Pete Dye Golf Trail now consists of 8 courses located throughout Indiana, including the Birck Boilermaker Golf Complex's other well-known gem, the Kampen Course! Government : Looking for information about the upcoming Election? Need to know where and when to cast your vote? Follow this Link to the latest information from the Tippecanoe County Board of Elections. Hospitals : one of the first multispecialty clinics in the nation. Since then IU Health has grown to include over 40 specialties, 23 outpatient clinics and a 191 bed hospital. University : The Colleges and Schools at Purdue University have been dedicated to preparing students for a competitive job market. Please look through our academic catalogue below to find the program that will help meet your career and life goals. Events : St. Patrick's Day Parade... celebrate Irish heritage. The parade will start at the intersection of Howard Ave. & Brown St. at 11 a.m. This all volunteer walking parade kicks off a great day of festivities at both Nine Irish Brothers. Welcome to our great hotel in Lafayette Indiana with affordable rates and cheap budget discount lodging. Red Roof Inn Purdue welcomes you to our budget hotel in Lafayette Indiana. Red Roof Inn Purdue will provide you excellent customer service with great amenities in comparison to all Hotels and Motels in Lafayette Indiana. Please visit us on your next stay in Lafayette Indiana and let us provide you with 4 star hospitality for 2 to 3 star budget rates. 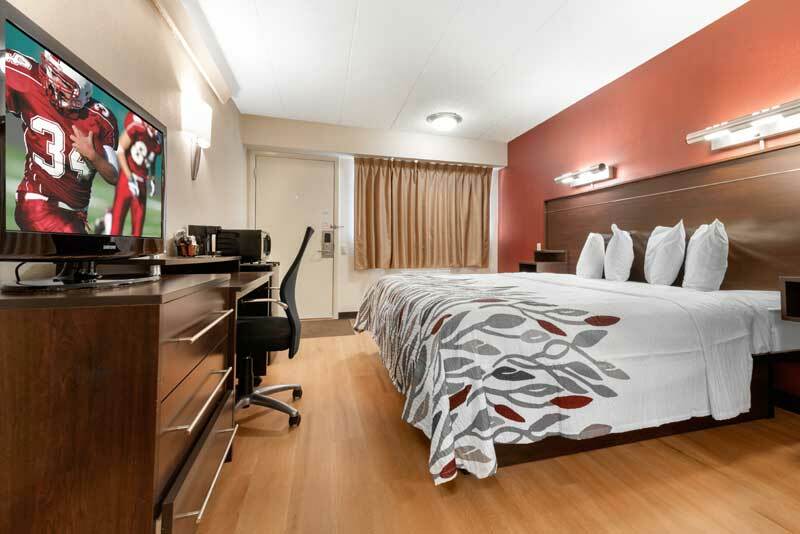 Red Roof Inn Purdue has been providing lodging and accommodations in Lafayette Indiana for sevral years and looks forward to providing our valued customer and business traveler with the best service in Lafayette Indiana for Hotels and Motels in our local area.